Among other qualities, a leader is someone who has influence on others. This was one of the main points of Wednesday’s Leadership class at Warwick Valley High School. The Leadership class is new this year, and is taught by Mr. Eugene Burns, a long-time WVHS social studies instructor. The full-year elective course, offered to juniors and seniors, focuses on leadership throughout history and on applied leadership theory. The course is designed to help students discover their leadership potential or hone their leadership skills. Along with projects that will allow students to demonstrate leadership at school and in the community, the class will hear from many guest speakers throughout the year. The first guest this year was the District’s Superintendent of Schools, Dr. David Leach. 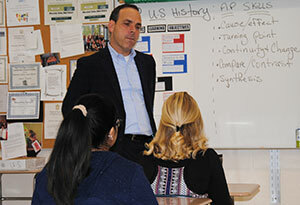 In his introduction of Dr. Leach, Mr. Burns spoke about the superintendent’s commitment to creating new opportunities for Warwick students (like this class), and his willingness to take time to speak to students about leadership. 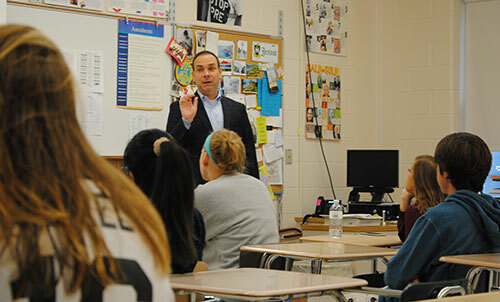 Mr. Burns hopes that, by having students hear the stories of a variety of speakers throughout the year, they will be inspired to find their own passion and adopt some of the qualities of great leaders – qualities that can help them now and might just steer them toward success in the future.